One of my many and varied jobs at the moment is editing a magazine called Manna. I’m thoroughly enjoying working on the summer issue as the theme is Food & Farming, which means I get to talk to people across Somerset who are involved in producing our food. One of the highlights so far has been interviewing an incredibly inspiring farmer called Anita near Clevedon in North Somerset. We chatted solidly for three hours about the rewards and challenges of running a farm while bringing up a family, stopping only when her husband popped into the kitchen to let us know one of the cows was calfing and to see if I’d like to take some action photos. Of course I jumped at the chance and I very nearly blubbed when the gorgeous little heifer came into the world. As well as the herd of dairy cows, Anita also has free-range poultry. At the end of the interview she insisted I take away with me a huge tray of eggs. I loved the fact they were all sizes and colours. These are the ‘imperfect’ ones the supermarkets won’t take. While we do appreciate eggs in our house, we’d have been hard pushed to get through this little lot, so I shared them with my good friend Sarah. We’ve been enjoying more than our usual quota of eggy breakfasts and I’ve made a batch of lemon curd. But of course, we also had to make meringues. 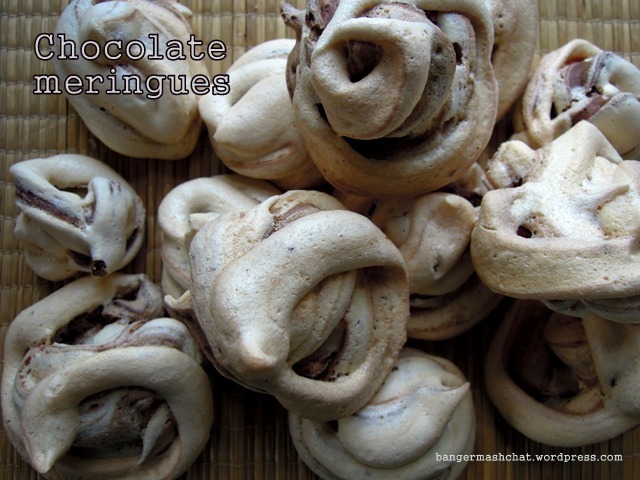 I’d seen a recipe for chocolate meringues on the BBC Good Food website and have been meaning to give them a try, so here was the perfect opportunity. Mine turned out nowhere near as neat and pretty but they tasted just the ticket; light and crispy and a little bit chewy. The plain chocolate also stops them from becoming overly sweet. Which means you can easily much your way through quite a few in one sitting. The original recipe suggests you put all the meringue mixture into a piping bag and then “make a hole in the mixture all the way to the funnel tip. Pour the chocolate into the hole.” I don’t have the most delicate of touches admittedly, but I just couldn’t pull this off, even after several attempts. So instead I simply layered the meringue and the chocolate in the bag, which worked OK. If you can get it to work, please come back and tell me how you did it! This is a recipe I adapted for the Aga. For a conventional oven, take a look at the original recipe on BBC Good Food. Break the chocolate into small pieces and place in a small bowl. Microwave on a low setting for a minute and then stir. Repeat again for another minute and so on, until the chocolate has just melted. 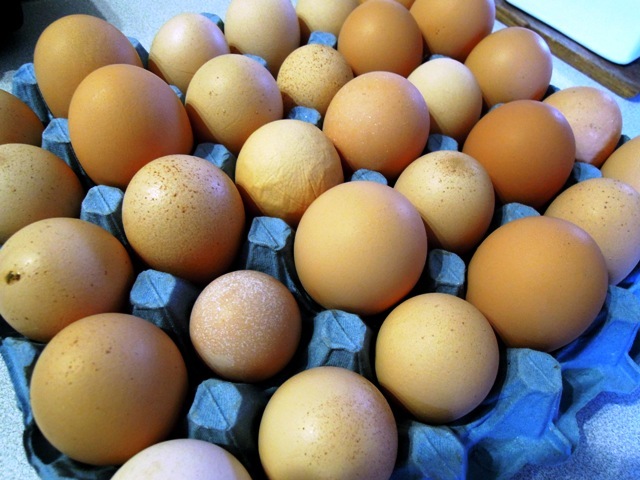 Allow to cool a little while you move on to the eggs. In a clean, large bowl add a tablespoonful of lemon juice to your egg whites and whisk until they form stiff peaks. Then add a tablespoonful of caster sugar and whisk it in, then whisk in another and repeat until you’ve worked in all the sugar. Your meringue will now be looking sumptuously thick and glossy. Line a couple of baking sheets with greaseproof paper. 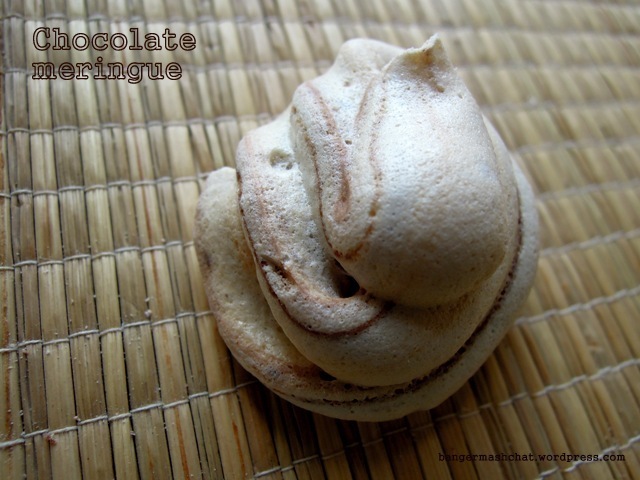 Spoon a little meringue into a piping bag and then pour in a little chocolate. Keep alternating until you’ve filled the bag. Pipe meringues onto the baking sheets about 4-5cm across, taking care to space them well. Keep going until you’ve used all your meringue mixture. Depending on how big your piping bag is, you may need to refill once or twice. Start by baking the meringues at the top of the roasting oven for 5 minutes and then transfer to the bottom oven for 40-50 minutes. Check every now and again as you don’t want them too crunchy. I think they’re perfect when they’re still a little chewy. What a great job you have – a chance to go out and talk to some really interesting people. I tried making raspberry meringues last summer… big disaster! 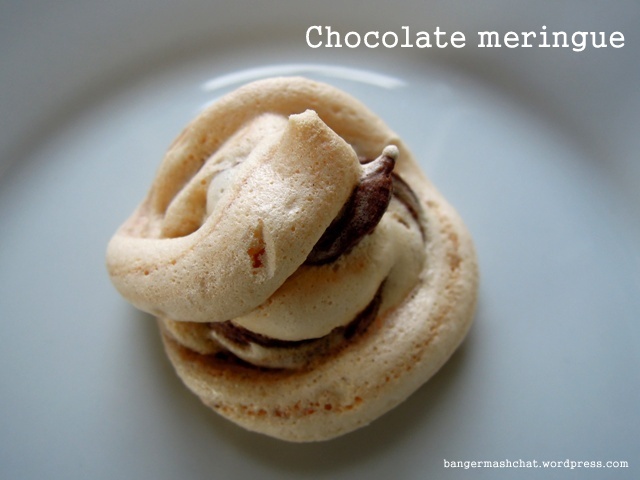 But maybe now enough time has passed for me to have another try at flavoured meringues, and chocolate sounds like a good flavour to start with! They look lovely. I suppose you could try making a “funnel” with a skewer or something, wiggled into the cone, and pouring the chocolate in that way. The stripe will be thicker at the end, however.